Best Is Yet To Come is the awe-inspiring new album from seminal UK soul / R&B star Tony Momrelle. Fresh from the success of the new single ‘Rising Up’, described by SoulTracks as “an instant classic” and supported by Trevor Nelson on BBC Radio 2, Tony Momrelle returns with an exquisite new body of work that represents a decisive moment in his solo career. 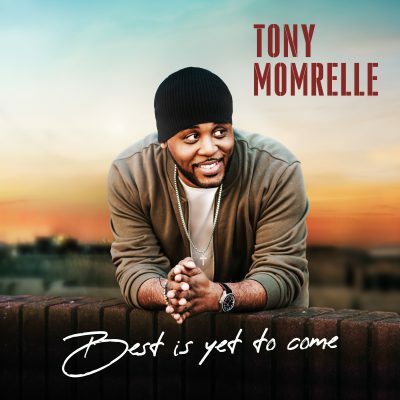 Best Is Yet To Come is arguably Momrelle’s finest album to date, truly demonstrating his exceptional prowess as a songwriter, as well as showcasing the outstanding vocal ability for which he is widely known. Described by Trevor Nelson as “a mainstay of the UK soul scene”, Tony Momrelle has long been in demand as the go-to singer for a plethora of A-List artists, lending his vocal excellence to the bands of Sade, Chaka Khan, Earth, Wind & Fire, Janet Jackson, Gloria Estefan, Whitney Houston and Gary Barlow, not to mention being a lead soloist in the legendary band Incognito and the ever popular Reel People. Now with Best Is Yet To Come, Tony Momrelle has channelled his inimitable talent into his own solo project, the result of which is an album that clearly positions him as an equal and contemporary of the luminaries with whom he has collaborated. For a lucky few, the album will be played for the first time at the Hampstead Jazz Club, on Wednesday April 24th. The event is invitation only, for those with a “Promo Code”, secure 1 of 10 golden tickets ON SALE from Friday April 12 @9am. Tickets are £25 and include entry and a signed CD and house red/white wine during the evening.